The Endurance, of the British Imperial Trans-Antarctic Expedition of 1914-16, was built in 1912 by Framnes Mek. Verks, at Sandefjord, and engined by Akers of Christiania. Her gross tonnage was 348 on dimensions 140ft. x 26.4ft. x 14.1ft., and she was the typical Norwegian whaler type of vessel, barquentine-rigged and launched 1912, as Polaris, a 3-masted barquentine with auxiliary steam for polar tourism and polar bear hunting! 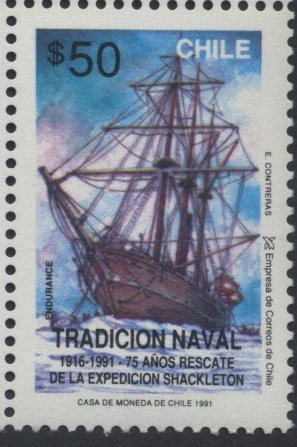 Purchased by Shackleton and renamed Endurance. She was ready to sail under the direction of Sir Ernest Shackleton, C.V.O., on August 1, 1914. When the Naval mobilisation order was published on August 3, Shackleton, with the consent of the crew, offered the services of the ship and her crew to the Government. However, the Admiralty did not think the war would last longer than six months and Sir Ernest was told to go ahead with his Antarctic plans. 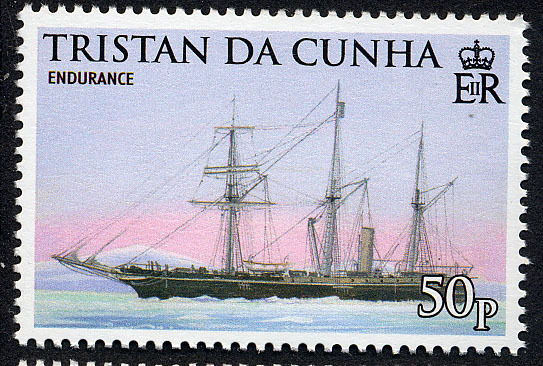 The Endurance carried a crew of 27 men in addition to the scientific staff. She sailed after Shackleton had been received by the King and assured of his Majesty's approval of the expedition. On this expedition a new coastline was discovered which Sir Ernest named Caird Coast in honour of Sir James Caird, who had subscribed £24,000 towards the cost of the expedition. Like the Deutschland, the Endurance was caught in pack ice, but the conditions were more severe than those experienced by the German ship. The British vessel was trapped on January 19, 1915, and crushed on October 27, 1915, finally sinking beneath the ice 25 days later. The crew took to the ice, which drifted across the Weddell Sea. When it was obvious the pack ice was breaking up, they took to the ship's boats which had been saved when the Endurance went down and on April 16, reached Elephant Island. What followed is an epic of the Antarctic—how Sir Ernest Shackleton left 22 men on Elephant Island, while he chose five men to accompany him in an open boat (the James Caird) to cross 800 miles of Antarctic seas to bring food and relief to the shipwrecked crew. Having successfully accomplished the almost impossible in a voyage of a fortnight, a mountain range of three ridges had to be crossed, one 5,000ft. high and covered in ice with dangerous precipices, before civilisation could be reached. It took them 36hrs. to overcome this obstacle. 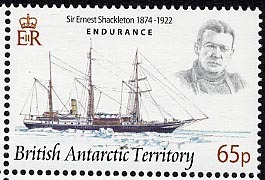 Eventually, Sir Ernest was able to effect the rescue of the Endurance's crew on Elephant Island, but it was not until several attempts had been made by the whaler, Southern Sky, the Uruguayan Government trawler Institute de Pesca, the British schooner Emma, and the Chilean Navy tender Yelcho, all led by Shackleton, that a way through the ice was found and the crew were picked up 41/2 months after their leader had left them. During the whole of that time Shackleton had thought of nothing but their relief. Expeditions: British National Antarctic Expedition 1901-04 in Discovery. British Antarctic Expedition 1907-09 in Nimrod. 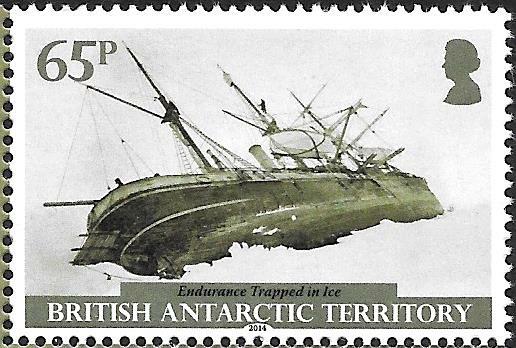 Imperial Trans-Antarctic Expedition 1914-17 in Endurance. Shackleton-Rowett Antarctic Expedition 1921-22 in Quest. Discoveries: Beardmore Glacier, South Magnetic Pole, Caird Coast. Voyage: British Imperial Trans-Antarctic Expedition 1914-17. Aus Ant SG45, Brit Ant SG75,249 Chile 1375 Fal Is Dep SG G34 Ross Dep SG36 South Georgia SG32. Built under yard 87 by Framnæs Mek. Verks., Sandefjord, Norway for a company formed by Lars Christensen from Norway and Adrien de Gerlach from Belgian. 17 December 1912 launched as the POLARIS. Tonnage 348 gross, dim. 42.67 x 8.04 x 4.28m. One auxiliary coal fired triple expansion steam engine, 350 hp, one shaft, speed 10.2 knots. Rigged as a three-masted barkentine. She was designed for the new formed company as a polar safari ship with paying guests, but when delivered the new formed company could not made the last payment, and the POLARIS was laid up waiting for a new buyer. 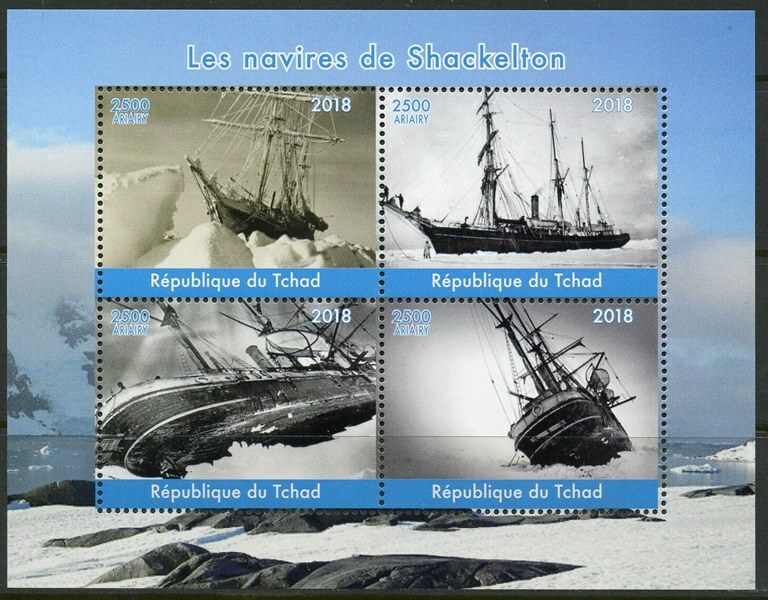 When Shackleton also short by cash was looking for a polar expedition vessel, and he did not have to pay for the POLARIS straight away but after some time, bought her for 225.000NKroner. She was renamed in ENDURANCE. Of her three masts, the forward one was square-rigged while the after two carried fore and aft sails, like a schooner. As well as sails, ENDURANCE had a 350 horsepower (260 kW) coal-fired steam engine capable of driving her at speeds up to 10.2 knots (18.9 km/h; 11.7 mph). By the time she was launched on December 17, 1912, POLARIS was perhaps the strongest wooden ship ever built, with the possible exception of the FRAM, the vessel used by Fridtjof Nansen and later by Roald Amundsen. However, there was one major difference between the ships. The FRAM was bowl-bottomed, which meant that if the ice closed in against her she would be squeezed up and out and not be subject to the pressure of the ice compressing around her. But since the POLARIS was designed to operate in relatively loose pack ice she was not constructed so as to rise out of pressure to any great extent. She was built for Adrien de Gerlache and Lars Christensen. They intended to use her for polar cruises for tourists to hunt polar bears. Financial problems leading to de Gerlache pulling out of their partnership meant that Christensen was happy to sell the boat to Ernest Shackleton for GB£11,600 (approx US$67,000), less than cost. 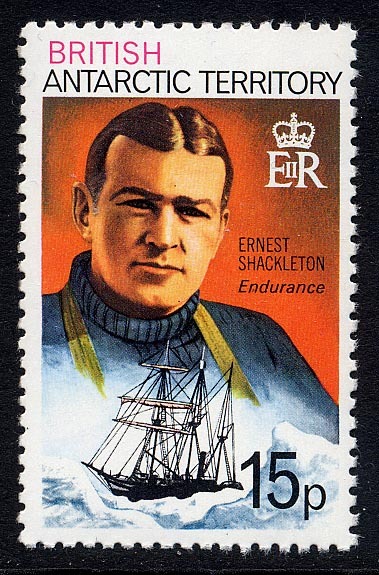 He is reported to have said he was happy to take the loss in order to further the plans of an explorer of Shackleton's stature 'After Shackleton's purchasing her, she was rechristened ENDURANCE after the Shackleton family motto "Fortitudine vincimus" (By endurance we conquer). 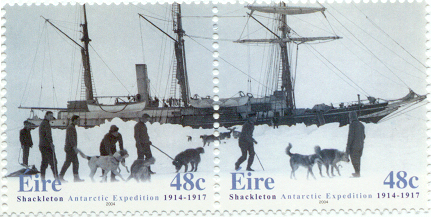 Shackleton sailed with ENDURANCE from Plymouth, England on August 6, 1914 and set course for Buenos Aires, Argentina. This was ENDURANCE's first major cruising since her completion and amounted to a shakedown cruise. The trip across the Atlantic took more than two months. Built for the ice, her hull was considered by many of its crew too rounded for the open ocean. Two days after leaving from South Georgia, ENDURANCE encountered polar pack ice and progress slowed down. For weeks Endurance twisted and squirmed her way through the pack. She kept moving but averaged less than 30 miles (48 km) per day. By January 15, Endurance was within 200 miles (320 km) of its destination, Vahsel Bay. However by the following day heavy pack ice was sighted in the morning and in the afternoon a blowing gale developed. Under these conditions it was soon evident progress could not be made, and ENDURANCE took shelter under the lee of a large grounded berg. During the next two days ENDURANCE dogged back and forth under the sheltering protection of the berg. ENDURANCE drifted for months while remaining beset in the ice in the Weddell Sea and drifted with it. The ice kept compressing it until ENDURANCE could not endure the pressure and was crushed on October 27, 1915. On the morning of November 21, 1915, the ENDURANCE bow began to sink under the ice. Like RMS TITANIC, the Endurance went vertical, her stern rising into the air, then disappearing beneath the ice. The ENDURANCE is considered the last ship of her kind. The crew of the Endurance in its final voyage was made up of the 28 men Blackborrow was originally refused a post aboard the vessel due to his young age and inexperience and decided to stow away, helped to sneak aboard by William Blakewell, a friend of his, and Walter How. 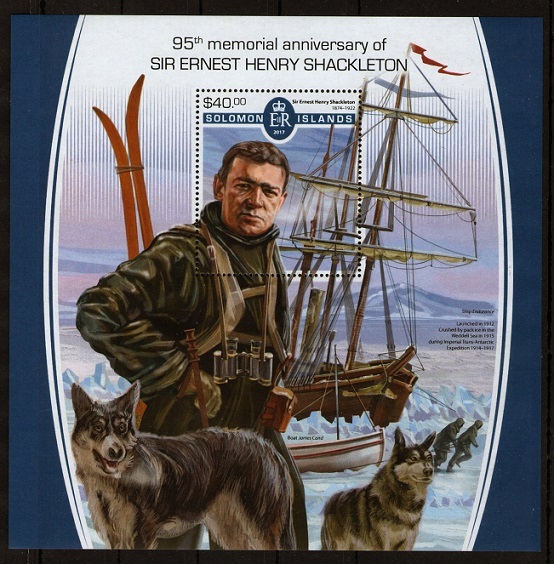 By the time he was found, the expedition was far enough out that Shackleton had no choice but to make him a steward. 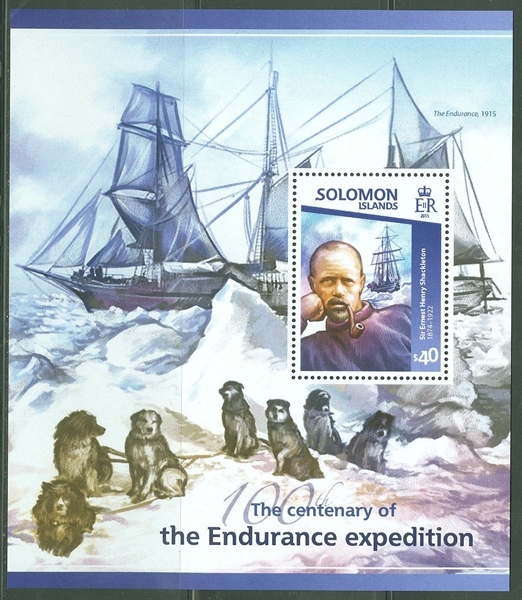 Blackborrow eventually proved his worth, earning the Bronze Polar Medal, and the honour of becoming the first human being ever to set foot on Elephant Island. His name is also the matter of some debate—it is sometimes spelled Percy, or Blackboro, or in other ways. 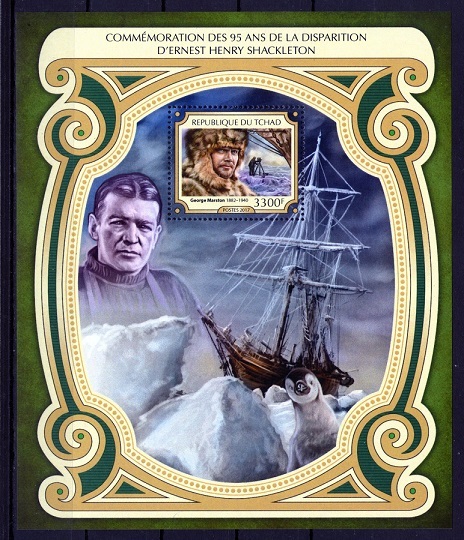 Alfred Lansing wrote a book titled Endurance: Shackleton's Incredible Voyage about the ordeal that Shackleton and his men endured aboard the ship. It became a bestseller when first published in 1959. Subsequent reprints have made it a recurrent bestseller; the last time being in the late 1990s. Two Antarctic patrol ships of the British Royal Navy have been named ENDURANCE in honour of Shackleton's ship. The first HMS ENDURANCE (originally named ANITA DAN) was launched in May 1956 and awarded Pennant number A171 sometime later. She acted as an ice patrol and hydrographic survey ship until 1986. Today's modern HMS ENDURANCE, nicknamed The Red Plum, is a class 1A1 ice-breaker bought from Norway in 1992 where she had been known as MV POLAR CIRCLE. She is based at Portsmouth but makes annual forays to Antarctica where she can penetrate through 0.9 metres (2 ft 11 in) of ice at a speed of 3 knots (5.6 km/h; 3.5 mph). She has a complement of 126 marine personnel and carries two Westland Lynx helicopters. In 1998 wreckage found at Stinker Point on the south western side of Elephant Island was incorrectly identified as flotsam from the ship. It in fact belonged to the 1877 wreck of the Connecticut sealing ship CHARLES SHEARER In 2001 wreck hunter David Mearns unsuccessfully planned an expedition to find the wreck of the Endurance By 2003 two rival groups were making plans for an expedition to find the wreck, however no expedition was actually mounted. In 2010 Mearns announced a new plan to search for the wreck. The plan is sponsored by the National Geographic Society but is subject to finding sponsorship for the balance of the U.S. $10 million estimated cost. 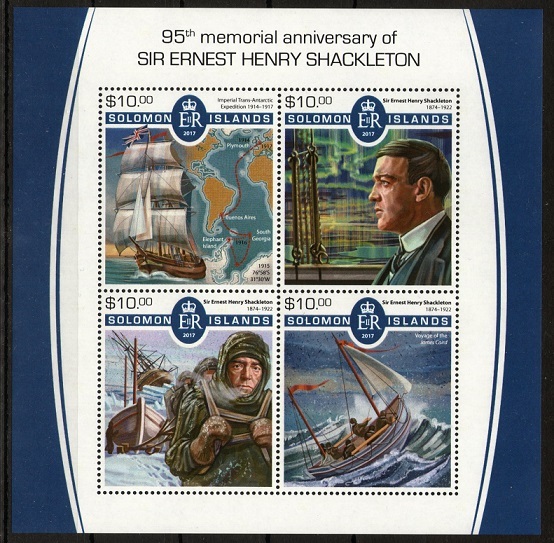 The 10p stamp features Ernest Shackleton and his Imperial Transantarctic Expedition ship ENDURANCE. The Weddell Sea party of the expedition visited South Georgia in November 1914 to take on coal and other stores and refit the ship before sailing for Antarctica. 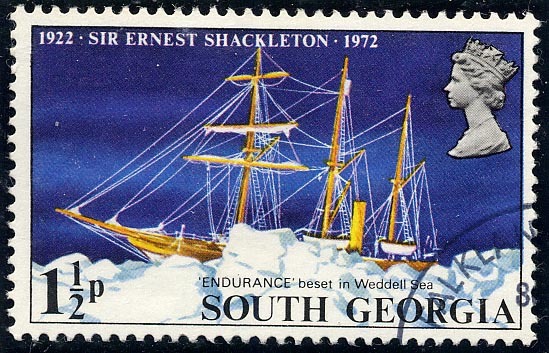 While in Buenos Aires, Shackleton was warned that it might be a bad year for ice in the Weddell Sea so he delayed his departure from South Georgia for a month. This gave time for scientific work to be carried out. Unfortunately most of the records and specimens were lost when ENDURANCE was crushed by the ice and sank. Shackleton is buried in the cemetery at Grytviken. South Georgia & Sandwich Islands 2015 10p sg?, scott? Maldives 2015 20M and 60M sg?, scott? Solomon Islands 2015 $40 sgMS?, scott? Sierra Leone 2015 6000L sgMS?, scott? sgMS?, scott? Guina 2015 10.000f sgMS?, scott? 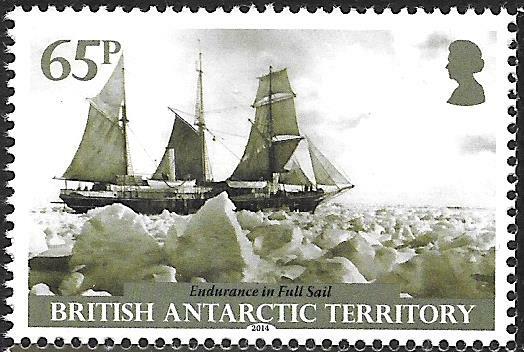 British Antarctic Territory 2014, 2x 65 p. StG.? Maldive Islands 2017 60MVR sgMS?, scott? Chad 2018 2500A sgMS?, scott? Last edited by aukepalmhof on Tue Mar 19, 2019 10:04 pm, edited 1 time in total. 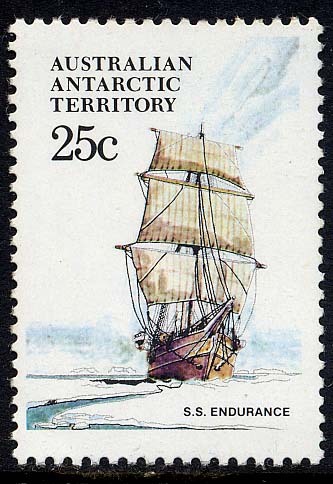 Australia Antarctic Territory issued 3 stamps and a miniature sheet in 2017 for the “AAT Cultural Heritage” of which the $1 stamp shows in the left of the stamp a sailing vessel which Watercraft Philately gives the ENDURANCE is depict, which is correct, a photo is used for the design I believe of the ENDURANCE in the ice. Human engagement with Antarctica is relatively short, but it has given rise to a rich cultural legacy. Australia’s direct encounters with this inhospitable southern continent stretch back to the late 19th century, with physicist Louis Bernacchi being the first Australian to step foot on the continent, in 1898–99, three years after the first recorded landing. But our connection with Antarctica pre-dates this, through whaling and sealing in subantarctic waters from the early 19th century and with Hobart used as a port of call for supplies by early European and American expedition parties. The history of Australia’s Antarctic association exists in materials ranging over documents, photographs, recordings, artefacts, monuments, built heritage and more. 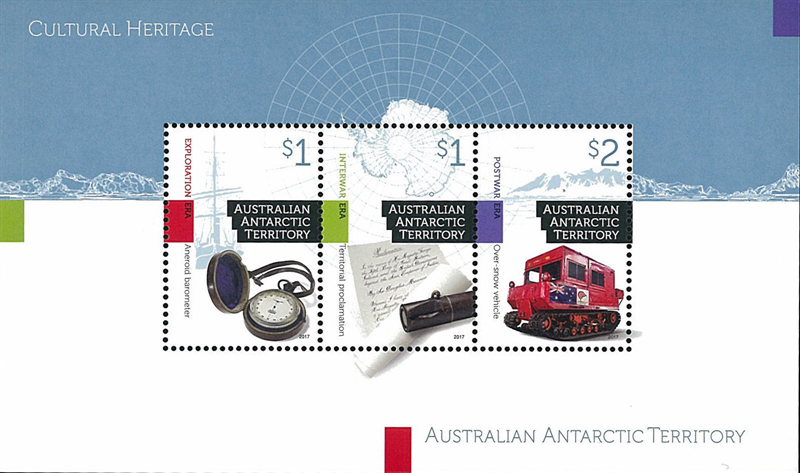 The AAT Cultural Heritage stamp issue, which will be released on 19 September 2017, presents cultural artefacts that relate to three key eras within Antarctica’s rich history. 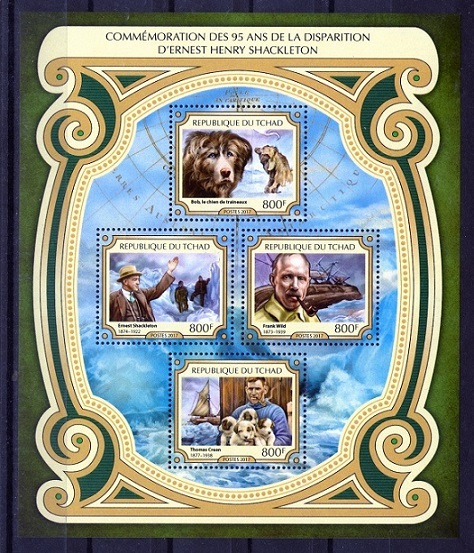 The stamp designs are by Lynda Warner. 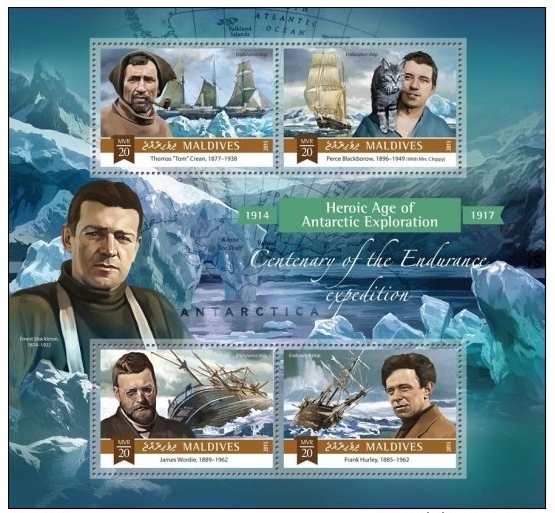 Spanning the late 19th and early 20th centuries, the exploration era is often known as the heroic period. 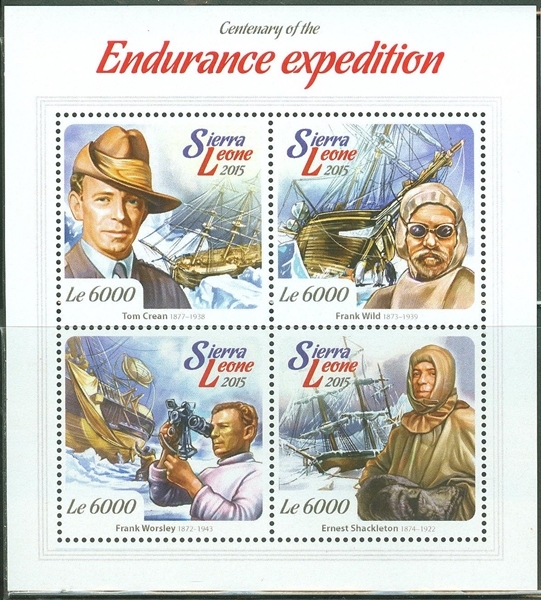 Several countries undertook voyages to Antarctica during this time, powered by the determination and extreme resilience of expedition members. Australians made significant contributions during this era, through scientific observations and recordings and through charting new territory. Australia had an interest in and presence on Robert Scott’s Discovery expedition (1901–04), and similarly on Ernest Shackleton’s Nimrod expedition (BAE; 1907–09), during which Australians attained the south magnetic pole in the longest man-hauling sled journey ever made. 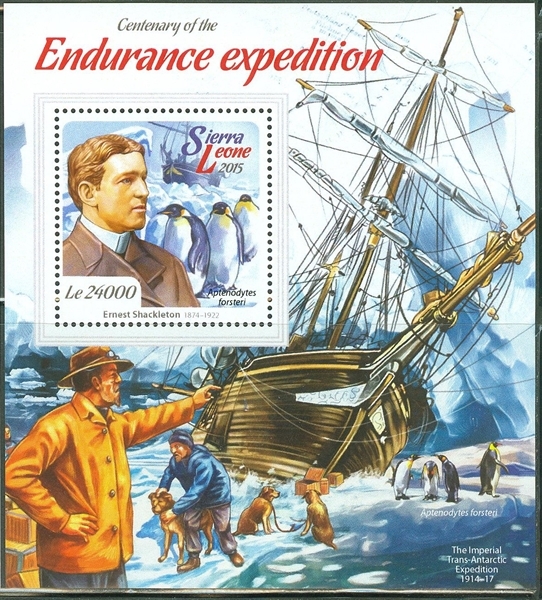 Douglas Mawson’s Australasian Antarctic Expedition (1911–14) charted coastline and investigated the ocean between Australia and Antarctica, and explored Macquarie Island; and Ernest Shackleton’s ill-fated British Trans-Antarctic Expedition (1914–17), which included an Australian contingent, epitomised the strength of the human spirit and ingenuity. 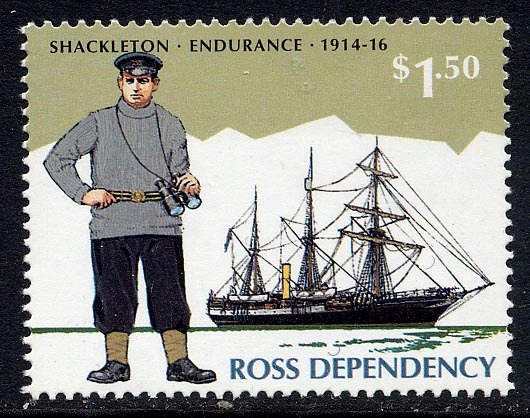 While the story of the latter expedition is known through the well-documented travails of Shackleton’s main party, the story of the Ross Sea party is lesser known. This party travelled on the AURORA to McMurdo Sound, from where they would lay supplies for the main party. Unknown to them, the ENDURANCE became trapped in pack-ice and was eventually destroyed. The men of this party laid supplies by sledge over 169 days, during which three of them perished. The AURORA, meanwhile, had broken its mooring during the winter of 1915 and been carried north by the ice, stranding the stores party. The survivors were eventually rescued by Shackleton and John King Davis in 1917. 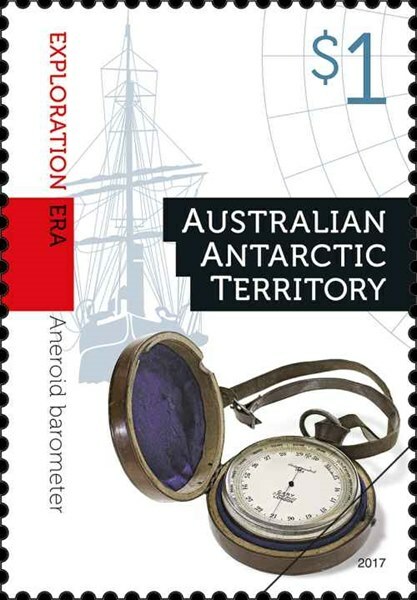 The aneroid barometer featured in the stamp design was given to Australian physicist Alistair Keith Jack, a member of the Ross Sea Party, by Ernest Shackleton. The barometer was made by the London-based company Cary. The barometer – held in the Museums Victoria collection and photographed by Michelle McFarlane – represents not only polar exploration during this period, but also the value of scientific observations, specifically meteorological research of the little-known continent. Douglas Mawson’s contribution to Antarctic exploration and science spanned the exploration and interwar eras. A preeminent figure of Australian polar history, he led BANZARE (British, Australian and New Zealand Antarctic Research Expeditions) voyages in 1929–31. 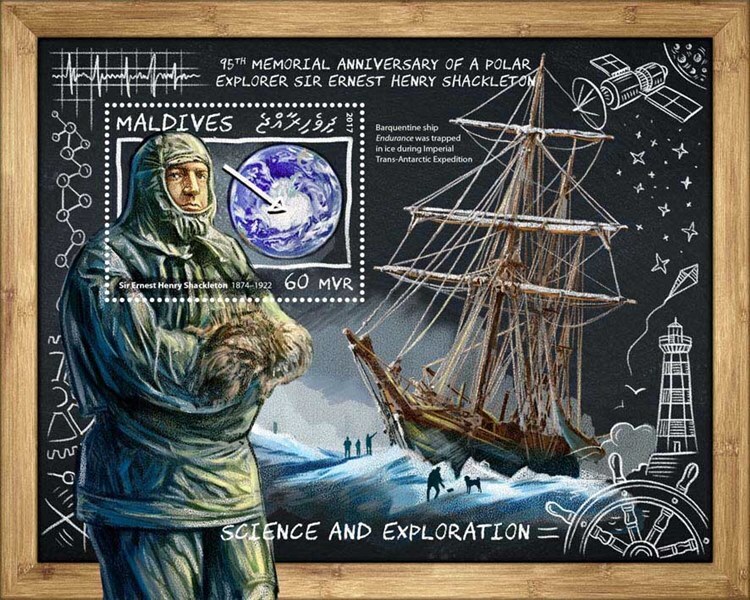 Many crucial scientific observations in multiple disciplines were made during these scientific expeditions, with great numbers of natural history specimens collected and much coastline mapped. While every expedition had a political dimension, the BANZARE voyages, financed by the three governments and Melbourne-based businessman MacPherson Robertson, were perhaps more explicit in this respect, resulting in territorial proclamations for Britain. The extensive mapping and the proclamations were significant for Australia’s eventual claim of 42 per cent of the Antarctic continent. 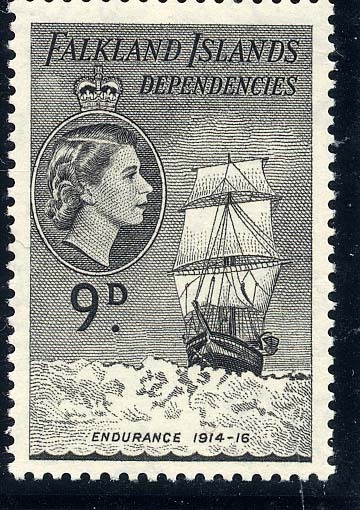 The stamp design features the proclamation over King George V Land that Australian polar explorer and scientist Douglas Mawson signed on behalf of the British sovereign on 5 January 1931. It was hand-written in copperplate by physicist and surveyor Alexander Kennedy and signed by Mawson, who read it aloud to his men at Cape Denison. They then buried it at the site in a canister fashioned from empty food cans. It was retrieved from beneath the cairn by the Australian Antarctic Expedition in 1977 and is now held in the collection of the National Museum of Australia. The proclamation is important to Australia because it forms the basis of Britain’s transferal of territory to Australia under the Australian Antarctic Territory Acceptance Act 1933. 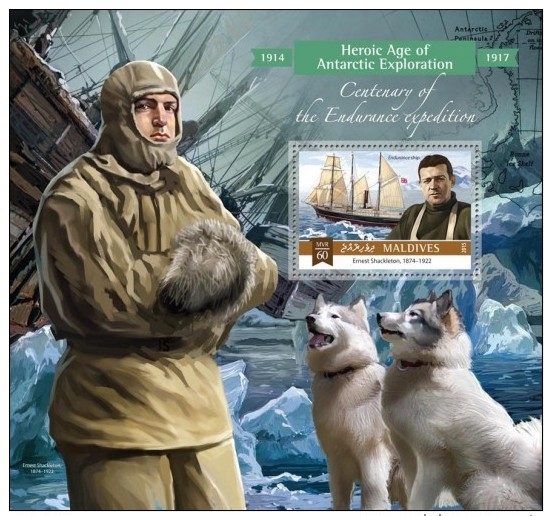 The document is also significant for its connection with eminent Australian Douglas Mawson. Following World War II, scientific interest in Antarctica was renewed, facilitated by Mawson’s lobbying of government. ANARE (Australian National Antarctic Research Expedition) was formed in 1947 to undertake Australian Antarctic research, with a program coordinated by physicist Dr Phillip Law, who was appointed director of the Antarctic Division in 1949. A stronger research presence was established through the construction of stations, first at the subantarctic Macquarie and Heard Islands, in 1947 and 1948 respectively. Until Australia secured the KISTA DAN, ANARE was unable to really expand its research program onto continental Antarctica. The ice-strengthened vessel enabled the establishment of Mawson station, the first permanent continental base, was built in 1954; Davis was established in 1957, coinciding with International Geophysical Year activities; and Wilkes was taken over from the USA in 1959 (eventually replaced by Casey). These bases and the development of more sophisticated science, communication and transport technologies allowed for the expansion of polar research in this postwar period. The tracked Weasel M29 vehicle was introduced to Antarctica postwar, the all-terrain vehicle having been used extensively by the US army during World War II. It was a primary Antarctic traverse vehicle for ANARE until the mid-1960s. The restored Weasel shown in the stamp design, in a photograph by Jonathan Wherrett, was used on ANARE’s 1962–63 Wilkes–Vostok traverse, an historic journey of 3,000 kilometres to the Russian station in the Antarctic interior. The traverse was undertaken by a party of six, led by RB Thompson, with a scientific program that included seismology, glaciology, geomagnetism and meteorology. Leaving the coast base of Wilkes on 17 September 1962, the party travelled with two Weasels, two D4 Caterpillar tractors and nine sleds, with the Weasels achieving two miles to the gallon. The party arrived at Vostok on 18 November and returned to Wilkes on 14 January 1963. The restored vehicle is in the collection of the Australian Antarctic Division. 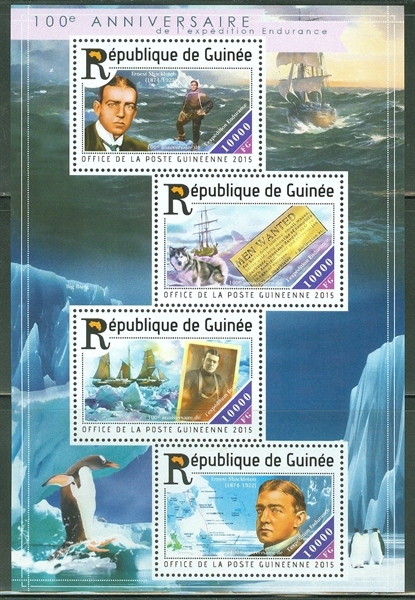 The content was produced at the time of the stamp issue release date and will not be updated. AAT 2017 $1 sg?, scott?